Tool use, once considered unique to our species, is now known to be widespread in the animal kingdom. It has been reported in most of the major taxonomic groups, with notable exceptions being myriapods, amphibians and reptiles. In insects, one of the best documented examples of tool use is seen in members of the ant genus Aphaenogaster. 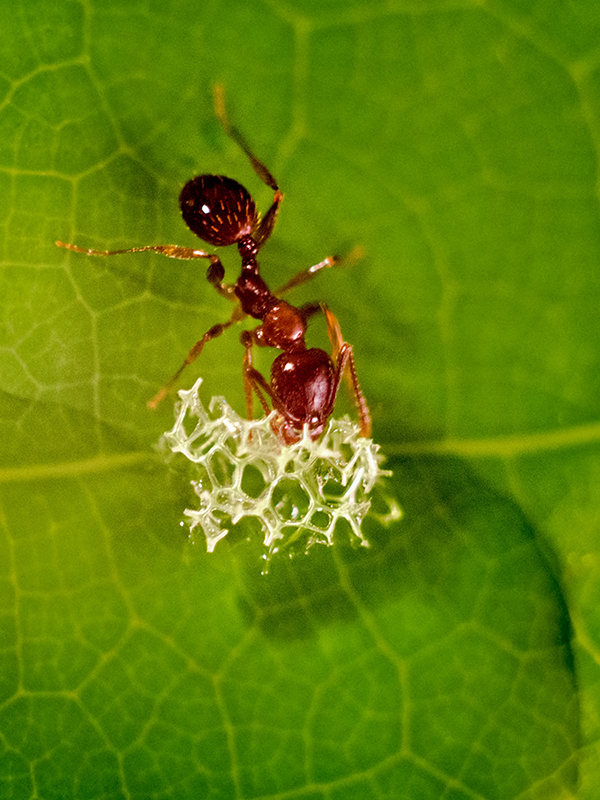 When these ants encounter liquid food sources, they drop bits of leaf, soil, etc. into the food, and then carry the food-soaked tools back to the nest. By using tools, individual workers are able to transport much larger volumes of liquid food than they would if they carried it internally in their relatively small and non-distensible crop. Image credit: an Aphaenogaster subterranea worker dropping a piece of sponge into honey-water. Photo by Imola Bóni. Used with permission. But how do ants select among various materials as suitable tools? A recent study suggests that the physical properties (e.g., soaking properties) of tools are important in this respect, and ants show unexpected plasticity in their behavior. However, we still know little about other factors that can influence the decision of which tools to use in certain situations. 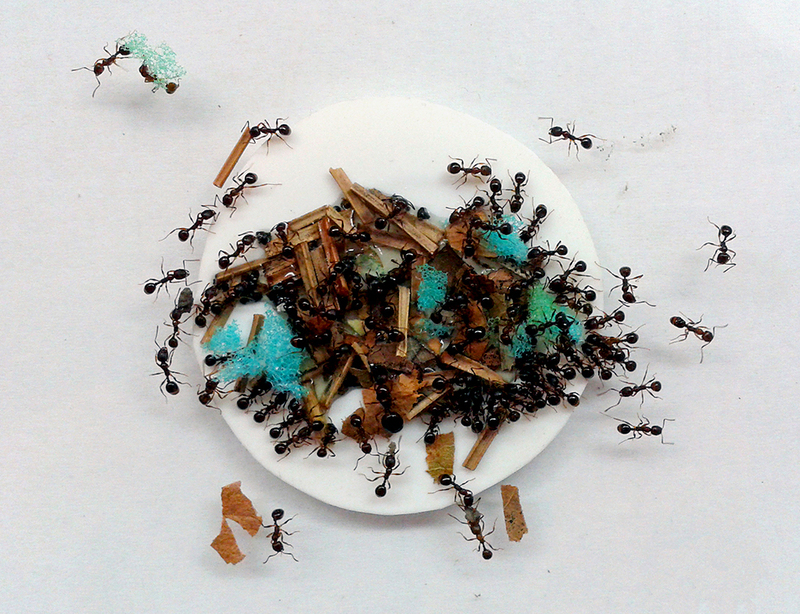 To elucidate this issue, we investigated the tool-using behavior of Aphaenogaster subterranea by examining how tool-using workers deal with various foraging challenges. For the experiments, we used different types of tools and liquid baits with varying distances between the baits and the tools. The tools provided for the ants were materials used in nature (small soil grains, large soil grains, pine needles, and leaves), and we also used a tool type of anthropogenic origin (sponges) to examine the role of familiarization with a novel material. Three types of liquids with different viscosity (water, honey-water, and honey) were selected to test whether ants behave differently depending on the bait’s viscosity. Baits and tools were arranged in such a way as to allow us to model the ecological constraints affecting the foraging behavior of ants. In one setting, all the five types of tools were placed at a closer (4 cm) or at a further distance (12 cm) from the bait, while in the other setting one type of tool was placed closer (4 cm) to the bait, while the rest were situated at a further distance (12 cm). We predicted that ants would select the most easily transportable tools, but the preference for certain tools would change with the change in the foraging environment. Image credit: a honey-water bait covered with tools. Note workers at 6 and 9 o’clock carrying soil grains to the bait. Photo by Gábor Lőrinczi. Used with permission. In accordance to our predictions, ants showed the strongest preference for small soil grains, the smallest and most easily transportable tools. However, when large-sized and unmanageable tools were the first to be discovered or were more readily accessible to the ants, workers used these tools more frequently. Why did they do that? By selecting easily manageable tools, ants can optimize their foraging effort, since these tools, though have weaker soaking capacity, can be most efficiently and rapidly transported to the baits and then to the nest. On the other hand, when ants are not aware of all alternatives available to them, they use the first discovered or most readily accessible tools (mostly regardless of the degree of their transportability) in order not to waste time looking for other tools with more suitable properties. Interestingly, ants not only selected tools that were best matched to the particular foraging environment, but also improved the use of certain tools. After some time, when workers became familiar with the provided tools, they regularly tore sponges and (rarely) leaves into smaller pieces to ease handling and transportation. Moreover, in many cases, colonies allocated a relatively large number of workers specifically to this task. What our study reveals is that the tool-using behavior of ants is even more flexible and adaptable than previously thought. This is intriguing, especially in light of the fact that flexible tool choice has been mainly documented in vertebrates like corvids and primates. The tendency of improving certain tools is particularly an interesting finding since tool manufacture is very rare in animals, most likely because it increases the complexity of the tool-using process. The ability of ants to learn how to use novel tools more effectively suggests that social insects may possess much higher cognitive capacities than we realized. Bumblebees, for instance, can learn to use tools by observing others and improving upon what they observe, as was shown in a recent study. The question is: what are the limits of flexible tool use and complex cognition in insects? Featured image credit: An Aphaenogaster subterranea worker near a drop of honey-water covered with soil grains. Photo by Imola Bóni. Used with permission. Gábor Lőrinczi, Ph.D. is a senior lecturer at the Department of Ecology, University of Szeged, Hungary. He, together with Gábor Módra, Orsolya Juhász, and István Maák, co-authored the paper "Which tools to use? 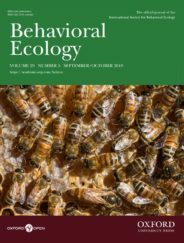 Choice optimization in the tool-using ant, Aphaenogaster subterranea", recently published in Behavioral Ecology.